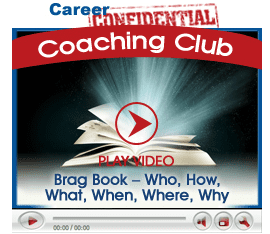 "So I had no idea what a brag book was until I got into Peggy's Coaching Club. Now, I know and saw how it helped me get a job. My new boss has asked if he can use my brag book as a sample for his daughter who is a new college graduate looking for a job. After I said yes, I revealed my secret - Career Confidential's Coaching Club. He said he was going to buy it for his daughter. I know it will help her just like it did me! I love my new job and know it is because of these awesome products." You are more than your resume. Show the hiring manager why you’re the top candidate when you put together a brag book that supplements your resume with evidence. A brag book is a historical look at your past successes—performance reviews, “attaboy” (or girl) notes, awards, performance statistics, and more. Everyone going into an interview situation should bring along this “proof” of your results, your accomplishments, and your achievements. It’s a “show and tell” piece that’s more powerful than many people realize, but it must be done very well to be truly effective.